The pairing mechanism in high-Tc superconductors still remains an intriguing mystery. We present here a microscopic model calculation of the interplay of spin density wave (SDW) and superconductivity (SC) in high-Tc systems. 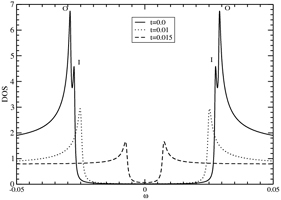 Further the charge density wave (CDW) is incorporated in the Hamiltonian as a pseudogap interaction. The pseudogap co-exists in the superconducting state and extends to normal phase above Tc. These three temperature dependent order parameters corresponding to CDW, SDW, and SC are calculated by the Green’s function technique by using the model Hamiltonian and are solved self-consistently. Finally, the conduction electron density of states (DOS) are calculated to interpret the scanning tunneling microscopy experimental data to explain the tunneling conductance of the system. The dip-hump structure as observed by the experiment is explained by our model calculation.